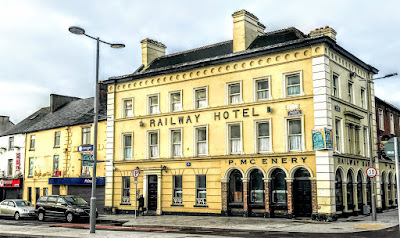 The Railway Hotel in Limerick is closed and stands forlorn opposite the Colbert Station, the rail and bus station in Limerick city centre. The hotel, which was once a popular venue for travelling GAA fans, was built almost a century and a half years ago. It closed last year with the loss of 15 jobs. But this week I noticed signs on the hotel and the sop next door saying they had been sold. 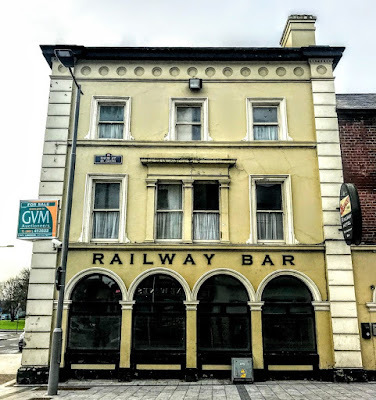 The Railway Hotel, once owned by the former Fianna Fáil TD Michael Collins and one of Ireland’s longest-running hotels, closed in June last year  ‘with immediate effect’ and with loss of seven full-time jobs and eight part-time jobs. The Railway Hotel dates from 1871, but it incorporates older buildings dating from 1800-1840 and began life as an old coach inn. In time, it developed into a 30-bed hotel, and for almost half a century it was a popular venue for hurling supporters travelling to and from Limerick for matches. This is a landmark corner building, at the junction of Boherbuoy, Davis Street and Parnell Street, with obvious associations with the train station on the other side of the street. It has a late 19th-century façade and is an amalgamation of two earlier buildings. 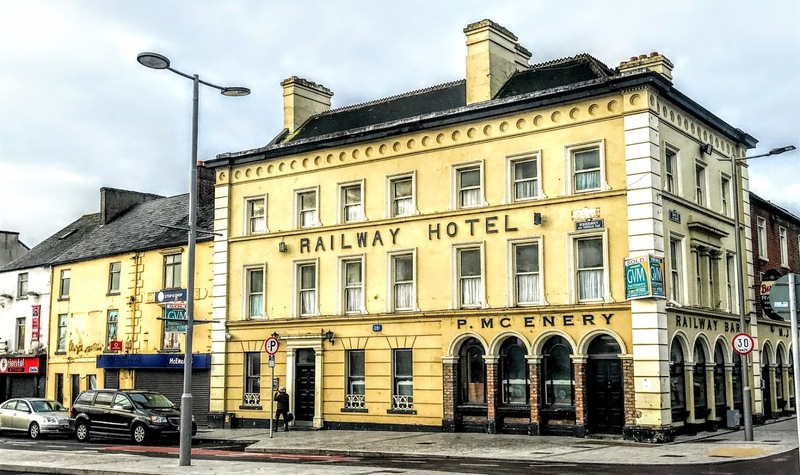 The façade decoration has extended to a terrace of three buildings on Davis Street at ground floor level, and the hotel had become a highly visible and familiar building to everyone arriving in Limerick at Colbert Railway Station. This terraced, seven-bay, three-storey hotel was first built around 1800. The north side facing Davis Street has a three-bay three-storey elevation and incorporates three two-bay three-storey terraced buildings, built around 1840. The main block is distinguished by the stucco façade detailing, dating from 1890, which unifies all the buildings through an arcaded stucco shopfront. The building has painted rendered walls with stucco façade embellishment that includes rusticated corner pilasters, over which the parapet entablature breaks forward and is further elaborated by a dentil and egg-and-dart motif. The parapet entablature has a frieze of blind oculi, and a lead flashed blocking course. The ground floor front is rusticated, with four bays on the façade. Each floor level is delineated by a continuous sill course, which continues along the entire north side at the first-floor level. For almost 50 years, the Railway Hotel was run by members of the Collins family for almost 50 years. The former Fianna Fáil TD Michael Collins comes from a well-known political dynasty from Abbeyfeale in West Limerick. A former publican and chairman of the Vintners’ Federation of Ireland, he was a TD from 1997 to 2007. His brother Gerry Collins is a former MEP and Minister for Foreign Affairs, and his nephew is Niall Collins, a sitting Fianna Fáil TD. The hotel was taken over by Michael Collins’s daughter, Michelle Collins, and her husband Patrick McEnery. But a downturn in the hospitality sector, increased competition and general trading difficulties forced Michelle Collins to take a tough decision last year. In a statement, she said that ‘after 46 years in business’ the hotel had to close ‘for economic reasons.’ She described the closure as ‘a very difficult and emotional time for the Collins family. The hotel was placed on the market by GVM Auctioneers with a guide price of €525,000. McEnery’s shop next door had an asking price of €125,000. The 31-bedroom hotel was described by GVM as ‘very prestigious [and] an ideal investment opportunity with much potential to develop.’ The facilities include a ‘well furnished’ modern bar with mahogany fittings, a meeting room with fireplace, an office, laundry room and 19 double bedrooms. The ‘Sold’ signs I noticed this week hopefully mean that once again this building could be a part of the social and business life of Limerick city centre. But the site also offers interesting commercial and development potential. I suppose we shall just have to watch this space.